Like many industries, the development path for medical devices differs with every product and its unique requirements. However, all medical devices have a series of FDA approval gates to clear and clinic trials to administer and analyze that often dictate a device’s path to market. One of the inherent byproducts of a complex approval process is the challenge of driving a device through multiple stages of prototyping in an efficient manner. How can design iterations be quickly and reliably produced so development can retain its forward momentum? This is where rapid injection molding is often leveraged for its manufacturing speed and material selection of engineering-grade thermoplastics that spans into the hundreds. There are certain plastics that lend themselves particularly well to medical applications. As mentioned in my previous article, a thermoset material such as liquid silicone rubber offers a host of benefits like biocompatibility and thermal resistance, which are ideal for medical and healthcare applications. But what about thermoplastics? If strength and durability are paramount, a high-temperature plastic like PEEK (polyetheretherketone) is a strong candidate for injection-molded parts. PEI (polyetherimide, often referred to by its trade name, Ultem) is another high-temp option, but there is currently a nationwide shortage and, as a result, limited availability for part production. Alternatives include PPSUs (polyphenylsulfones) like Radel and PSUs (polysulfones) like Udel, both of which are considered medical-grade plastics. High-temperature thermoplastics provide attributes like heat and chemical resistance during sterilization, long-term biocompatibility, and dimensional stability. The caveat, however, is a material cost that exceeds most other plastics. As a result, high-temp plastics are a solid option for devices and components that need only limited production volumes yet require an elevated level of material properties. Now, there are many more medical products — from monitor shells to electronic housings to diabetes testing equipment — that will never need high-temperature plastics. In that case, a more cost-effective ABS (acrylonitrile butadiene styrene) might be used for lighting fixtures or a device handle. Acetal has good lubricity and resistance to hydrocarbons and organic solvents, so it works well for products with fans or blower blades. Acrylic is regularly used for light pipes and lenses. Polycarbonate, which is also available in optically clear grades, is often seen in syringes. Transparent plastics have added value during early prototyping for devices that interact with fluids and have internal mechanics. In development, a design engineer may use translucent, medical-grade macro polycarbonate to observe the fluid path of an instrument, so he or she can make adjustments to part design before shifting to a non-transparent plastic. A simple disposable device, for example, may have just one mechanism that needs to be vetted. Translucent plastic can help them do that. In other instances, there’s a perceived value in end-use transparent devices where the user can actually see the internal functionality. For part submissions at each FDA gate, it is very important to prove that the components of a device can be manufactured in a repeatable way. Rapid injection molding is a manufacturing process that allows you achieve highly repeatable parts. Quality control should be in place to help evaluate the performance of injection molding presses and ensure that parts are being molded properly and consistently with each shot. Again, it’s all about repeatability at scale and ensuring the prototypes match the production parts in every way. This is one advantage that injection molding has over machining or 3D printing. This is very important to device developers who want to efficiently move towards market launch. Another important development consideration to keep in mind is if minor revisions are needed to a component’s design that is being injection molded, a product developer doesn’t always have to start over in the qualification process. Starting with tooling that is “metal safe” allows for minor design revisions that can more easily be applied to the original tooling by machining away the unwanted mold section(s). It is also much faster to remachine an area in the tool to adjust the design than to rebuild an entire tool, both from a production and development standpoint. Family, or multicavity, molds — where more than one cavity is cut into the mold to allow multiple parts to be made of the same thermoplastic material in a single cycle — are one way to reduce capital expenses, especially where only a low-volume run of components is needed. Instead of two separate tools for two component iterations, for example, a family mold can be made that includes version A and version B. That way, you can have two iterations in hand simultaneously, reducing tooling costs. Like product development in nearly every industry, iteration time is shrinking, despite the added regulatory requirements and the necessary clinical trials for medical applications. Given the cost of a failed clinical trial, both in terms of time and money, it is highly advantageous to have a tried-and-true manufacturing process identified well in advance of trials in order to have a higher chance of advancing to the next gate in the approval process. Let's return to our initial question of how design iterations can be quickly and reliably produced so medical device development can advance forward. With a continually expanding selection of thermoplastic materials, reliable part repeatability during prototyping and production, and the ability to make minor adjustments to tooling, rapid injection molding carries with it the elements needed to help push medical devices closer to market launch. 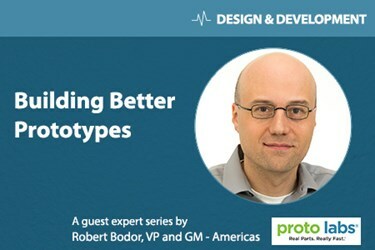 Rob Bodor is currently VP and GM of the Americas at Proto Labs, a leading online and technology-enabled quick-turn manufacturer of custom prototypes and low-volume production. At Proto Labs, he has also held roles as CTO and director of business development. Prior to joining Proto Labs, Bodor held leadership roles at Honeywell and McKinsey & Company, and has been on the executive team of two early-stage software companies in the Twin Cities. Robert holds B.S., M.S., and Ph.D. degrees in engineering and computer science.